Soak up the style and tranquility of the luxurious Mayfair at Coconut Grove. 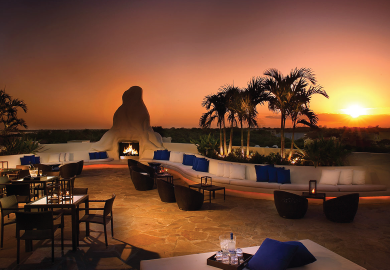 Located in the heart of Coconut Grove, this artistic masterpiece blends design elements from Europe, Asia, the Caribbean, Mexico, and South America, to pamper guests in an atmosphere that is both intimate and indulgent. Your experience begins in our stunning lobby where a single door set in a hand-carved mahogany frame welcomes you to the heart of Coconut Grove. Glide past the Gaudí-inspired façade and into a realm of Old World elegance. From there, rich Amazon Ironwood, sculptured plaster ceilings crafted by artisans from across the globe, and stained-glass windows by Louis Comfort Tiffany are the perfect complement to our thoughtful and intuitive service.